Chile, that “long petal of sea, wine and snow” in the beautiful words of its Nobel laureate, Pablo Neruda, stands out on a map of the world. At 2,700 miles north to south, it is longer than any other country except Brazil – roughly the same as Britain and the United States bolted together. Yet it is all of 40 miles wide at its narrowest point east to west, 220 at its widest and a little over 100 on average. 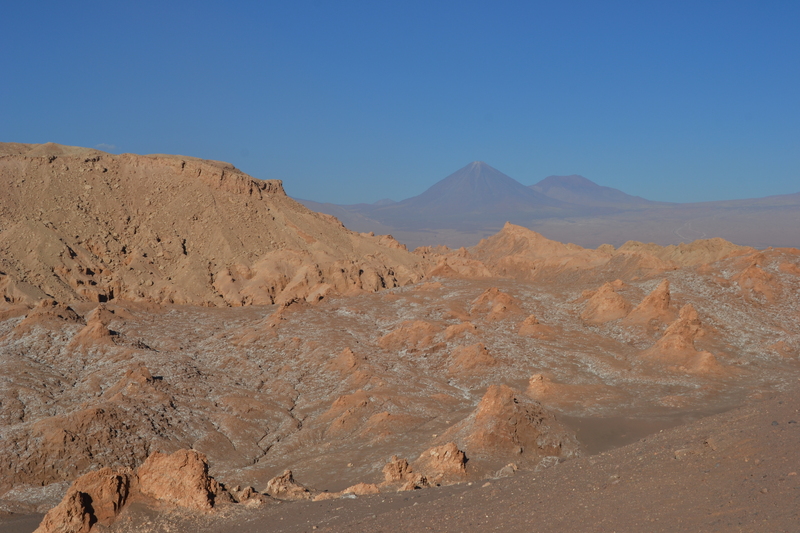 The south has glaciers and ski slopes, the north has the Atacama Desert. 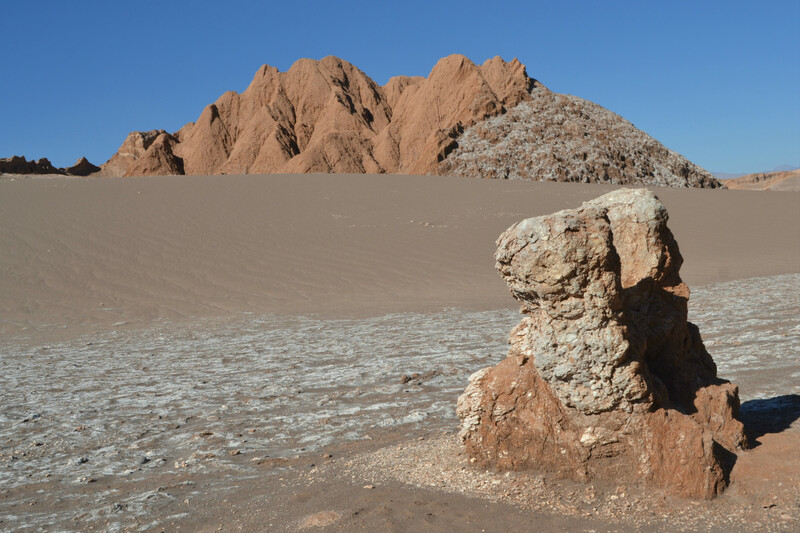 Geographers know it as the driest place on earth, but it is better known now for the San José mine where, in 2010, 33 copper miners were trapped underground for over two months. The Valle de la Lune (Moon Valley) is around 300 miles to the north of that, roughly in the middle of the desert. The sand is sprinkled with ancient salt deposits, like lorryloads of Shake n’ Vac. Natural sculptures sprout in the middle of nothingness. Dunes rise three storeys high, pristine except for a narrow strip which has been corrugated by the wind. Nature has carved the variegated sandstone into walls, as if of a fairytale castle. There are narrow alleys which you can squeeze through, and jump in alarm when the walls bang as they cool in the late afternoon and you think the whole lot will collapse. As the sun dies down and the sky dims, the golden rocks turn gradually pink then gradually red. The Licancabur Volcano we had tracked towards on our way from Bolivia was pink at the crater, blending to red, then blue, then purple at the base of the cone. Busloads of people had come to watch the sun set. They crouched with their cameras, fussing with tripods; or sprawled on the rocks, sipping wine from plastic cups. Back in San Pedro, I went to a restobar with tables outside and a bonfire to chase off the chill of the evening. The fire crackled and scented the air as I looked through the menu and the waiter brought a basket of bread and the bowl of pebre, which always comes with it in Chile. It is simple enough to make. Roughly chop a handful of coriander, toss with a couple of diced tomatoes, a few sliced spring onions and a finely diced green chilli, add a glug of wine vinegar, three or four of olive oil, a sprinkle of seasoning, and toss it all again. I was out by seven the next morning, looking to hire a bike. But everything was closed. Doors were bolted, windows were shuttered; there was no one else about. It was the same again when I went back at eight. A few cafes had opened by nine, but everything else was still shut. I had a coffee and an empanada de pino as I waited for the hire shops to unlock their doors. Then I really needed the exercise: Chilean empanadas are massive things, like half a rugby ball. Sometime around 9.30, the keenest of the hire shops opened for business and I chose a mountain bike which surprised me by stopping when I squeezed the brakes. Hire bikes tend just to slow down. I had, as always, to remind myself that it was left hand drive. Squeeze hard on what would be the back brake at home and you are over the handlebars wondering how it happened. I pootled around town and into the outskirts and rode out to the remains of a pre-Incan fortress named Pukará de Quitor. I could have cycled all day in that weather, but I had a bus to catch in the early afternoon: South towards Santiago. Never knew that bikes in the UK had breaks oriented the other way round… Bit worrying now that I realise that I commuted by bike for two years without ever noticing! Wow so bleak but so beautiful !